The first player to move all five of his/her tokens to the opposite side of the playing field and land the tokens on the finish squares in numerical order, WINS the game. Strategy. 2 to 4 Players. 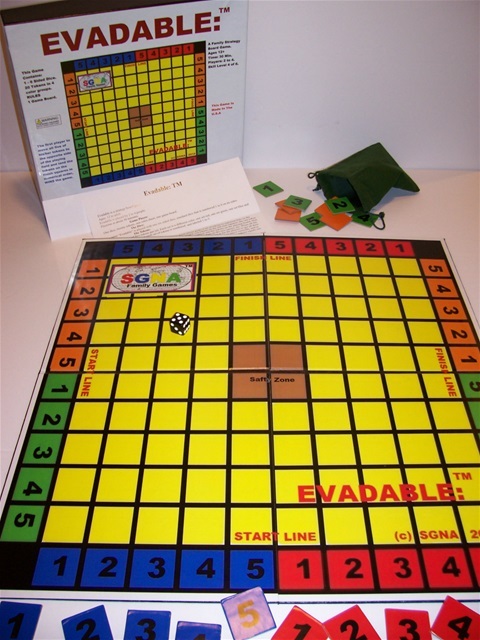 Evadable is a strategy board game. 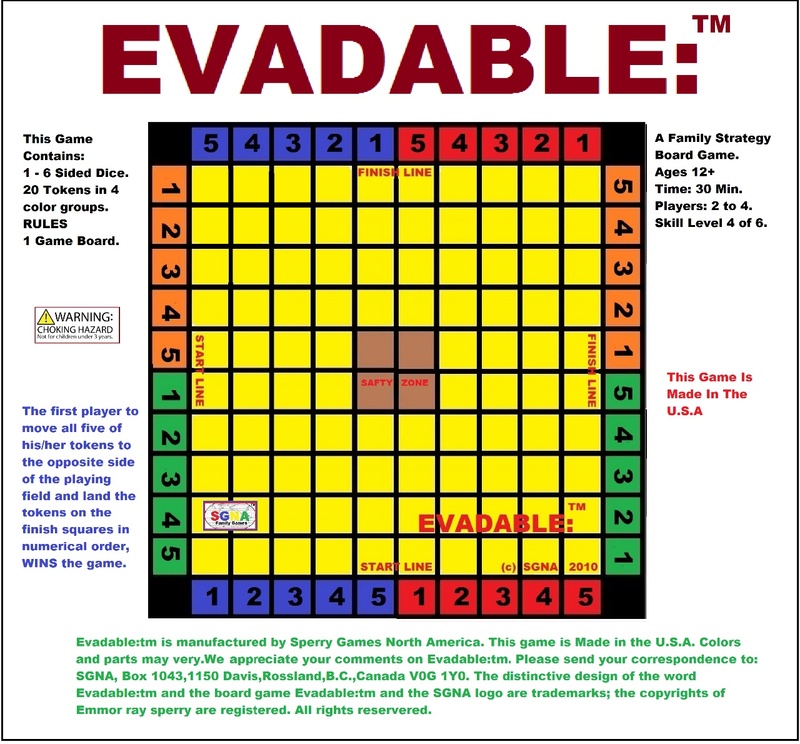 Evadable is played by 2 to 4 people. One dice, twenty tokens, one rules sheet, one game board. 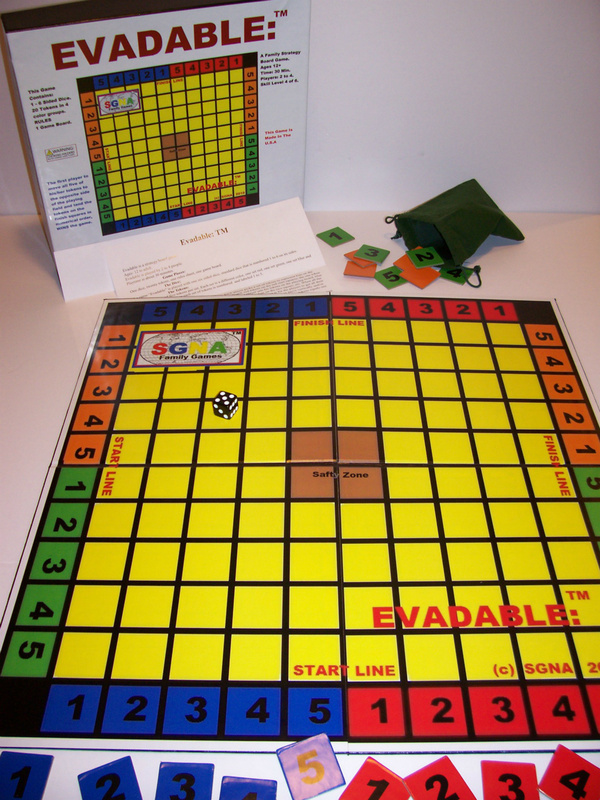 The game “Evadable” is played with one six sided dice, standard dice that is numbered 1 to 6 on its sides. There are four sets of five tokens per set. Each set is a different color, one set red, one set green, one set blue and one set orange. Each token in each set of tokens is numbered and labeled 1 to 5. Set the board on a table and the players sit around it. Each player picks a set of tokens to represent him on the playing board. Each player sets his tokens on the playing board, red tokens on the red start squares; the one token on the one square, two token on the two square, etc. The second player sets his tokens on the playing board, blue tokens on the blue start squares; the one token on the one square, two token on the two square, etc. When all the players have their tokens set up, the game is ready to start. The idea of the game is for the players to get all their tokens to the opposite side of the game board in proper numerical order. The tokens can move vertically and/or horizontally forward or backward, but the tokens can not move diagonally. One square by the tokens equals one space moved. Two tokens can not occupy the same square at the same time. The first player roles the dice, and moves his token the number that roles up on the dice. Example, the player roles a 5, he moves any one of his tokens 5 spaces. If a player[first player] ends his move by landing his token on a square that is occupied by another players[second player] token then the second player must move his token back to it’s starting position on the perimeter of the game field, and the first player leaves his token on the square. The 4 squares at the center of the inner playing field are colored light brown and are called “safety zone squares”. If a player has one of his tokens on a “safety zone square” then a second player can not land his token on that square. Once a player lands a token on its finish square, then that token is out of game play. The 4 corner squares are blacked out and are not considered part of the game. side of the playing field and land the tokens on the finish squares in numerical order, WINS the game.